A rare weekend off during the grueling business that is the NASCAR Sprint Cup season should be a time for the drivers to relax and enjoy themselves. Unfortunately, some of them may be spending the time off stewing about the results of the first six races of the 36-race schedule. Among those who have not fared well so far is Juan Pablo Montoya, who made the 12-man Chase for the Cup championship last season and fully expects to do so again this year. Thanks to some ill fortune, Montoya, who made it to the postseason last year with solid consistency, sits 25th in the 2010 season standings, 171 points behind 12th-place Brian Vickers. Of course, there’s still plenty of time to move up, and Montoya can always look at what Mark Martin, one of his racing idols, did last season. Martin was 27th after the first six races, but went on a run, including four victories, that carried him to the Chase. Martin began his comeback with a win at Phoenix, which just happens to be the next race on this year’s Cup schedule as well. But Montoya’s record on the one-mile Phoenix oval doesn’t foster great optimism about a quick turnaround. The former Indy car and Formula One star hadn’t finished better than 16th at Phoenix until he came in eighth last fall, his sixth race at the Arizona track. And this season hasn’t done much for his spirits, either. It hasn’t been for lack of speed. 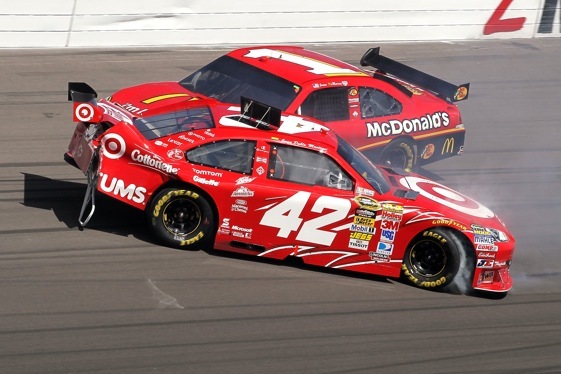 Montoya began with a solid 10th-place finish at Daytona, but consecutive finishes of 37th followed at California (engine failure) and Las Vegas (crash with teammate Jamie McMurray). He bounced back with a third-place run at Atlanta, but Montoya’s last two outings, at Bristol (wreck) and Martinsville (flat tire), produced finishes of 26th and 36th for a very inauspicious start. Of course, Montoya isn’t alone in his early season struggles. Of the dozen drivers who made it into the Chase last season, six are outside the top 12. Carl Edwards, Denny Hamlin, coming off a victory at Martinsville and Martin aren’t far off. They, along with Kyle Busch, who was last season, currently rank from 14th to 17th and remain in good position to move up. It’s going to be tougher for Kasey Kahne in 20th, Ryan Newman in 22nd and Montoya. McMurray, who came to Ganassi Earnhardt Racing over the winter and immediately won the Daytona 500, has foundered since that big victory and is 19th. They have a week to think about it, but all of them can look at what Martin did last year and take heart.